I love the cream soda. I, too, like Zevia. It just feels healthier than regular soda. Congrats on winning!! And your float sounds delicious! I'd love to try the Strawberry, I haven't seen that flavor yet! I LOVE Zevia! My favorites (so far of what I've tried) are the cola and ginger ale. Looking forward to Dr. Zevia though! Congrats on winning! That Skinny Dreamsicle does sound good! I'd like to try the Cherry Cola. I want to try the grape!! Sounds yummy! I'd love to try the Strawberry, but none of my local stores carry it. I would like to try any of the flavors. Grape sounds the best, but I kinda like all the options. I have not tried Stevia and I would like to see if I like it or not. 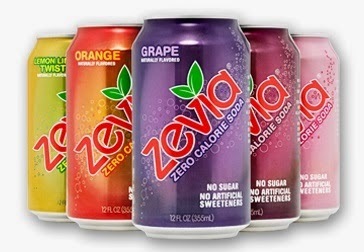 You know, I've never tried Zevia Zero Calorie Natural Soda. It definitely looks good - I'm going to give it a try! I most want to try the orange Zevia. I would like to try the orange to make a dreamcicle type of beverage. I would like to try the ginger root beer. Love to try out the Lime Cola--so far haven't seen it at my store. I would live to try the cream soda! I love zevia! I am going to buy some 6 packs later today. I'd like to try the ginger root beer flavor. I want to try the Orange flavor!! YUM!